Welcome to Yoga for Health. Presently I am teaching 5 classes each week from my home studio in Lanesville. Classes are small (no more than 9 students), carefully instructed, and each student is encouraged to take time to truly feel what they are experiencing in each posture, each breath, each thought. 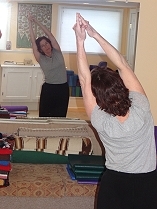 in each posture that make the practice unique to each student. I am available for private yoga instruction, scheduled for your convenience. Call 978-281-5525. Arrive a few minutes early. Consider being on time as a part of your practice. Leave shoes outside the Studio door in the shoe racks. Remember to turn your cell phone off. Come in quietly and enjoy the peaceful energy of the room. You can begin to gently stretch or lie down and relax or greet your fellow students. Please do not use perfumes, scented lotions or hairsprays before coming to class. People with allergies can be very sensitive to them. I suggest that you purchase your own yoga mat. I like to provide “loaner” mats for new students, but encourage continuing students to have their own. This will help you to begin to practice Yoga at home between classes and also because it is more hygienic. Only your energy will be on your mat, not everyone else's. Please speak with me about any pre-existing or special condition that may effect your participation in the class. Be compassionate with yourself in all that you do. “Do what you can do and don't do what you cannot do”. Rest when you need to. Do not force yourself to “keep up” with anyone. Please remember that “Yoga” is much more than hamstrings and headstands. It is our breath, our attitude, our kindness, it is the way we live our lives each day. 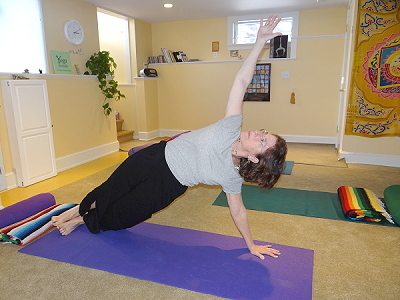 Yoga is the balancing of our mental, physical and spiritual selves through conscious awareness. Enjoy your practice!